Dry Cleaning. Give your clothes a second life. We all know that times have been tough for a while now. And with all the downsizing and belt-tightening going on across the country, shopping and consuming habits have shifted – in some cases, dramatically. Take clothing sales, for example. In the second quarter of 2009, the TJX Companies (the parent of discounters Marshalls and T.J. Maxx) reported a rise in both sales and profits. On the other hand, Saks, the parent of Saks Fifth Avenue, slid down in both categories. So as you can see, all those belts are now getting tightened around much more affordable pants. Of course, there’s little sense in belaboring or dwelling on all these changes (clothing and otherwise). In the words of a great anonymous American philosopher…It is what it is. What we can do is find ways to help make what we do have go a little bit further. And share those nuggets of information with one another. Forming a search party to scour the cluttered racks of Marshalls for fresh new arrivals is one way to do this. 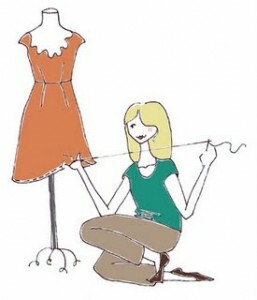 But there’s also another approach you can take – restoring your own damaged or discarded clothes. After all, why deal with the guilt and pressure of spending big (or medium) money on new clothes if you can spend even less money to breathe a “second life” into the clothes that already hang (often sadly) in your closet? Clothing restoration just so happens to be one of Sudsies’ specialty services. Mildew stains on your old leather jacket. Smoke damage on that once-favorite dress of yours. Fraying around the collar of your favorite golf shirt. Damage from another dry cleaner. We can address all of these issues and more with our clothing restoration services and on-site tailor and seamstress. We even use a state-of-the-art odor treatment process to get rid of any “old” or just plain “ugly” smells that may be hanging out back there with your neglected clothing (misery loves company). If you’ve had clothes damaged due to natural disasters like hurricanes, floods, or fires, we can help you itemize your clothing restoration billing in a format that’s easily accepted by insurance companies. Just remember, the longer your damaged and neglected clothes are left to wither and weather away, the more effort will need to go into reviving them from the dead. So go ahead. Break out your forgotten old pants (just maybe not the Zubaz). You’ll be surprised how well that tight belt fits them. This entry was posted on October 26, 2009 at 10:46 am, and is filed under Sudsies Blog. Follow any responses to this post through RSS 2.0. Both comments and pings are currently closed.